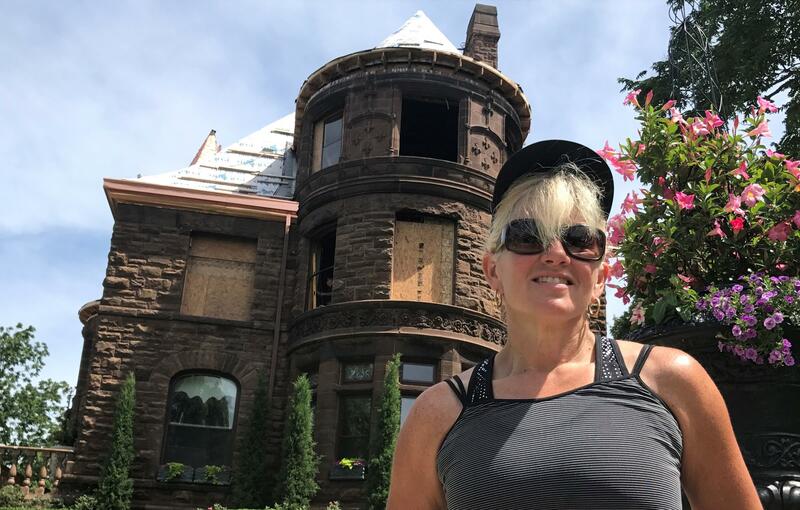 Susan Sommers says friends in the neighborhood were a major reason they are renovating the Scarritt house, again. Nothing could have prepared Susan Sommers and Larry Roeder for what they saw when they arrived at the scene of their Northeast Kansas City renovation project on September 19 of last year. It hadn't even been a full day since the couple had returned to their home in Hiawatha, Kansas, after spending the weekend working on the 1888 William Chick Scarritt home. The renovation had been an ongoing effort for the last ten years. They faced a charred outer shell. The distinctive three-foot diameter turret hollowed out, four chimneys toppled and the 34,000 pound slate roof had fallen two and a half stories to the first floor; some weighty shingles tumbling all the way through to the basement. The Scarritt House at 3240 Norledge Ave., right behind the Kansas City Museum, is one of two surviving buildings in the Kansas City area by renowned Chicago architects Daniel Hudson Burnham and John Wellborn Root, according to Bradley Wolf, historic preservation officer for the city. Sommers says friends called them immediately when they saw the early morning flames and fire trucks. Officials say the fire was reported around around 5 a.m.
Larry Roeder and Susan Sommers are doing much of the renovation work on the Scarritt Home themselves. "It was much easier to hear from a friend rather than from the police or fire department," she says. The idea of starting over was overwhelming. "Had it not been for this neighborhood," Sommers says, "we may not have made the decision to restore it." She's standing at the end of the long walkway leading up to the brownstone with her husband's hammer pounding from inside the home. A handful of neighbors, enjoying the sunny spring day, stopped on the sidewalk to greet her and check in on the progress of the project. The Scarritt Home was listed on the National Register of Historic Places in March 1978, and the Historic Kansas City Foundation recognized the preservation efforts 2012. A plaque just outside the front door describes the importance of the building, a major example of the Chateauesque style adapted from from the French and Renaissance chateaux of the 15th and 16th centuries. Thomas Strenge, who lives around the corner on Gladstone Boulevard, says the community wanted to see the restoration continue. "The house is fantastic," Strenge says, "So important to not only this community, but the city." Kent Dicus, president of the Northeast Kansas City Historical Society, says the couple's decision to start over reflects a dedication to history. "Kansas City doesn't always hang onto it's landmarks," Dicus says. At one time, Kansas City had a number of buildings by the the world-famous architects, Burnham and Root, according to the Kansas City Landmarks Commission. A Y.M.C.A. building on the current site of the Ilus Davis Park, between the Federal Building and City Hall. It was demolished in 1973. The old Board of Trade Building at 210 w. 8th St. was demolished in 1968 and is now a parking lot. The Waldheim Building at the northeast corner of Main and Petticoat Lane was torn down in 1987. The James Lombard residence, 1805 Jefferson St. 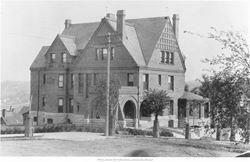 The James Lombard house at 18th and Jefferson was designed or built the same year as the Scarritt house, 1888. There is one remaining example, once a Baptist Church, now the Arts Asylum at 1000 9th Street. Sommers says it took about a month to clear everything out. 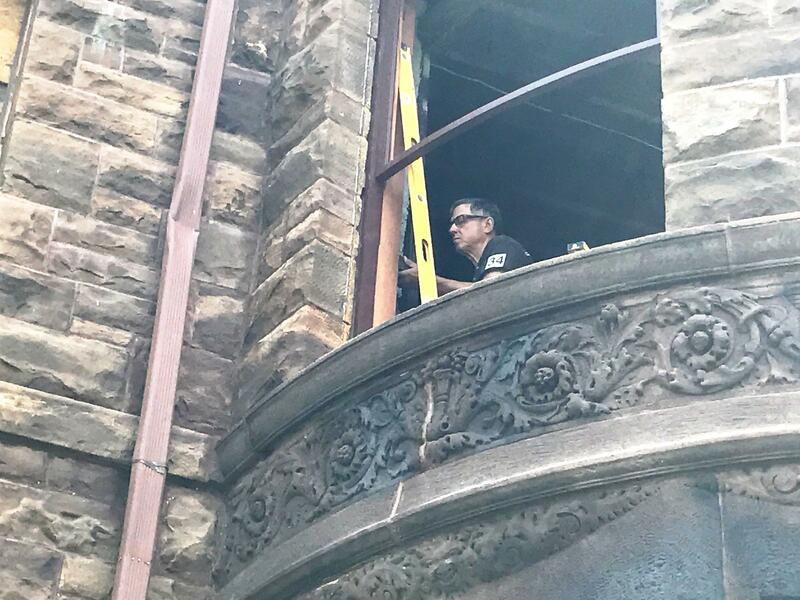 They've been working on rehabilitating the building since. They've rebuilt three of the four chimneys; the fourth one didn't meet contemporary safety standards. Thousands of pounds of slate recently arrived from Brazil and are ready to be installed on the roof. New copper gutters have replaced the original, slate ones. Custom-built mahogany frames have been installed in preparation for window panes. New copper gutters have replaced heavier slate ones. The inside interior is being remade essentially in it's original style: Italian plaster walls, decorative stencil artwork and ceiling frescoes. A reception room and ballroom have been restored along with eight bedrooms and seven bathrooms. Sommers says one of the few changes they've made is to closets; they've been expanded to accommodate more modern hangers. Many of the pieces of the house are still being built in the garages of neighbors. Sommers says it's just one of the myriad ways they've helped. "They housed us for three months, brought us dinner and washed our clothes," she says. "We wouldn't have made it without the support of our neighbors." Sommers and her husband travel from their home in Hiawatha, Ks. to work on the renovation as often as possible. Laura Ziegler is a community engagement reporter and producer. You can reach her on Twitter @laurazig or via email at lauraz@kcur.org.